Recently, I have invited by Sungei Wang for a Fabulous Food Discovery event. We were brought to 9 shops that located at Sungei Wang. 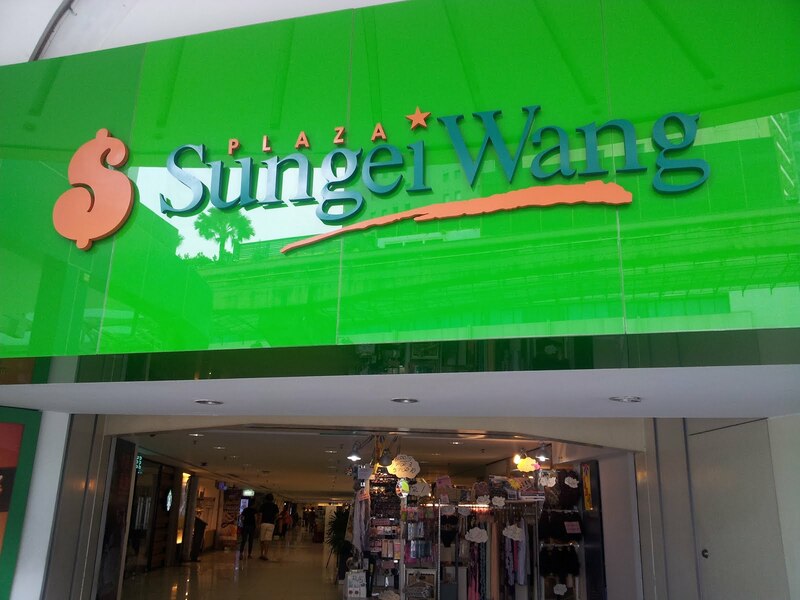 Sungei Wang is located at the busiest spot in KL which is Bukit Bintang. A lot of tourists hung around there for food hunt. There are lot restaurants around the area, but if you want a low cost and air conditioned restaurant, then you must can Sungei Wang search for food. From A-Z cuisine directory, you can find it at Sungei Wang! MY REVIEW: I like the nasi goreng ayam berempah very much because the taste of the ayam rempah is superb ! Neither too salty nor spicy Its just meet my taste..haha While the drinks, you may try their kopi ping which is their signature drink. -provide high quality traditional Nyonya kueh and food without preservatives at a reasonable price [start from RM1.10 per box]. MY REVIEW: I like the onde-onde and the Pulut Tai Tai with kaya sauce very much! You should bring your foreign friends come and try these local delicacies. MY REVIEW: I love the Asam laksa as I’m person who likes sour food with a spicy taste…ahaha.. Apart from this, I want to recommend for those who like to drink soup about the Herbal Chicken Soup. The Soup is damn delicious when you eat with rice! This herbal chicken soup can help you regulate your body heat and benefit to your health. MY REVIEW: I like this concept so much because I no need to stand under hot scorching sun eating hot food. Ayam Kunyit and Thai Food is my favourite. If you hardly find Nacho food, then you must try the Chezzy Beef Nacho. You must eat while it is hot so that you can feel crunchy of the Nacho. Thai Chicken wing and Sotong Ayam Kunyit with homemade sambal are simply the best ! The price is reasonable ranging from RM5.50 to RM10. ~~~When you step into the shop, you will see both sides of the wall full of Vietnam pictures and make you feel like in Vietnam. ~~~ When talking about Vietnamese food, you all should know about Beef Noodle Soup(Pho),Spring Roll and Vietnamese Coffee(Café Sua), don’t you ??! My review: I have a great chance to watch the making of fresh prawn spring roll by the in-house chef ! The taste of the fresh prawn spring roll is quite different with the Chinese spring roll. I will more prefer the fried spring roll because maybe I don't adapt of the herb they use in fresh prawn spring roll. I would like to recommend to try their beef noodle and their lemon grass chicken with a glass of Café Sua. >> There is no doubt that the high popularity of this shop is because of their cakes. Their best seller chocolate indulgence is my favourite cake! >>This time, their menu has launched some new dessert which is Shinjuku French Bake and the square cake with various flavours such as chocolate and red velvet. MY REVIEW : Its worth to worth 10 minutes for the Shinjuku French Bake hot served with caramel topping as this dessert is nice to eat when hot and is just meet the sweetness that I like. I’m a person who does not like to eat too sweet. MY REVIEW: I can say that the combination of Mango juice, Mango cubes, and Sago is perfect. For the mango feast, I like the mango crisp as I can feel the crunchy of mango ice in the middle ..ohh~it so nice !! Really can’t resist it ~The matching of the coconut and birds nest was so good and you can get it at only RM23.20. The last one I will recommend the curry combo; the taste of the curry fishball is different with the Hongkong fish ball I had before, I love this more. MY REVIEW: Their lunch is cheap and big in portion come with their in-house soup. Besides, I like the ambience of the café with their sentimental music playing. I found that a lot of foreigners enjoys their lunch in this café. I like their Stir Stewed Chicken with Three Cup Sauce among the menu. -It served Korean homemade hand cut noodle like Kalguksu or Spicy Kalguksu and 4 types of Korean Bingsu. MY REVIEW: I like the concept of this shop and their spicy kalguksu . The hand cut noodle is as smooth as silk when you swallow the noodle. About the bingsu, their speciality is the ice is made of milk which means the milk is freeze at first and then shaved to the ice. I like the strawberry Bingsu among others. You must try it !! Another special thing to mention, you not only can eat at the shop but also can buying accessories too. This must be crazy for the women shopper. oohh my!!! i'm interested with the kuih nyonya!! looks yummy!!! wow...a lot nice food at sg wang plaza. remind me must visit back . i been at this area for 10 years back . Now have a lot nice food there ~ You should revisit again ~They have made changes ..
Nice and good food serve to us. Let's go Sg Wang again. The rest is ok to recommend but Kopi Club @ Sg Wang I am totally against it. Bad experience there. Oh~ I see..but i have try their food there quite nice..Do you mind share what bad experience you had there? refer to your blog and go makan..still like the food at u cafe.. Wahh!! i din't know got Street Food with Food Truck concept! I love eating the nasi ayam in Sg wang! my favourite! The food truck concept just launched 3 months ago ..So faster go and try their food there. I'm rarely in Sungei Wang and when I am there, it is always just shopping. Thanks for opening my eyes on the delightful food fare offered at the mall. After your shopping haul , you get to try the food there..Their food is nice and cheap..
Sungei wang has re-opened? I thought it was still under renovation!! Will visit soon, so many shopping memories there, I want to see how it has changed! Oh gosh... the food... it is sooo tempting... I cannot get enough of that Kalguksu and the accompanying Kim Chi!!! Seldom go Sungai Wang...but will try out for the food!!! Your photo looks so nice!!! There are sure alot of food choices we could have at Sungai Wang! They serve great food =D Gonna try it next time! oh now i knw what to eat next time when i visit kl ! This place seems to have quite a good number of options for shoppers. I love mango sago. Yup...Previously i also don't know sg wang have came out a lot of food outlets..Their Mango Sago is nice as the bowl really full of fresh mango cube and suitable for family dining..
i love Lulu Nyonya's food! it's very delicious and yes, it's cheap, totally value for money! Wow~ Thanks for compile the list, now I know where to hunt for foods when I visiting Sg Wang. Wow, you blogged most of the food outlet. Well, personally I like the Korea one and U cafe that is value for price. Wow did not know that there are so many restaurants there. Ok i will dropby for lunch someday. Sungei wang now come out a lot different food outlets which are price affordable and the food are quite delicious ! Thats a great compiled list of cafes and it is good to check here before heading for a cafe. Thanks ! Those food i have mentioned in my review is my favourite food in the shop..So, you can try it when you drop by there..
wow, food hunting at Sg Wang.. call me along next round! btw have followed our google follower below, do return the favour thanks!